Why should we care about heritage grains? Local grain movements are quietly infiltrating communities throughout the country and beyond in response to the absence of locally grown heritage grain varieties and the infrastructure to support a local grain economy. These heritage grains are both more flavorful and more nutritious than modern varieties and are sustainably grown thereby improving both our health and environment. The goal is to re-introduce the production cycle or "grain chain" that was once an integral part of our local food system. 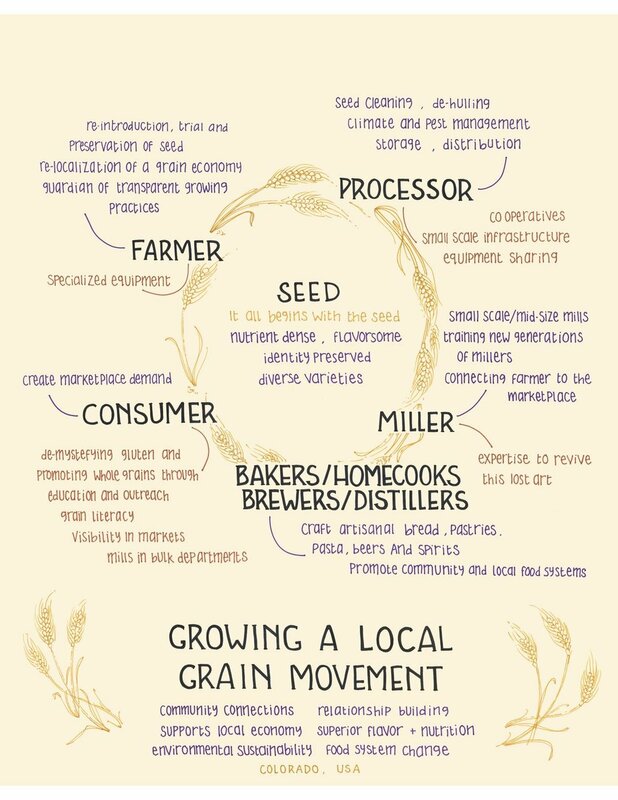 Growing a local grain movement focuses on supporting and engaging all the stakeholders in a local food chain- in this case a grain chain- from seed saver to grower to miller to end user. Until recently, the grain movement had been mostly left behind in the local food movement. The re-localization of a grain economy and a return to pre-industrial varieties of grain as well as the agricultural practices that go along with it will support small scale farmers and the community they serve on many levels. Grain growing- particularly heritage and ancient wheats- encourages environmental sustainability (augments farm diversity, boosts biodiversity and sustainable agricultural practices) and produces a product high in nutritional value. The first link in this chain is the seed and the farmer. Relationships are being forged with farmers to provide support through seed trials, equipment resources, marketing opportunities and community building. At the same time education and connection between growers, processors, millers, end-users such as bakers, chefs, brewers, distillers and the local community must be fostered. Above all there is a commitment to providing access to whole food- rich in flavor and nutrition. The re-localization of grains, which are a key component of our diet, will help boost diversification on farms, promote healthy diets, build local economy and support a community’s food resilience strategy. On an overarching level it builds community and connections around food literacy and cultural preservation. I believe there is a great need for a return to the flavor and nutrition found in heritage and ancient grains particularly in response to the rise of modern wheat related allergies and diseases. There is a huge gap in supplies in Colorado and beyond. Paired with a great enthusiasm and consumer demand in our community and beyond we are poised to be changemakers in the grain revolution.